This article is about Francophone Belgians. For matters relating to Franco-Belgian ties, see Belgium–France relations. The Walloon flag was chosen as flag of the French Community of Belgium in 1975. It was adopted by the Walloon Region in 1998. In Belgium, the French Community (French: Communauté française; French pronunciation: ​[kɔmynote fʁɑ̃sɛːz]) refers to one of the three constituent constitutional linguistic communities. 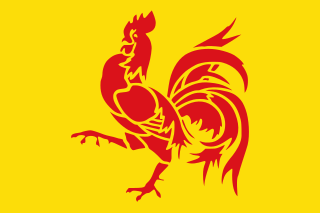 Since 2011, the French Community has used the name Wallonia-Brussels Federation (French: Fédération Wallonie-Bruxelles), which is controversial because its name in the Belgian constitution has not changed and because it is seen as a political statement. The name "French Community" refers to Francophone Belgians, and not to French people residing in Belgium. As such, the French Community of Belgium is sometimes rendered in English as "the French-speaking Community of Belgium" for clarity. The Community has its own parliament, government, and administration. Its official flag is identical to the Walloon Flag, which is also the official flag of the Walloons of Wallonia. Wallonia is home to 80% of all Francophone Belgians, with the remaining 20% residing in Brussels, which is the seat of parliament of the French Community. Historically, this community spoke variants of Walloon, Dutch, Picard, Luxembourgish or Moselle Franconian German, but nowadays, the dominant language is overwhelmingly Belgian French, except for some areas alongside the border to the Grand-Duchy of Luxembourg (mainly the district called Land of Arlon or Arelerland), where Luxembourgish is still widely spoken. 900,000 living in the Brussels-Capital Region (out of 1.1 million inhabitants). French speakers who live in the Flemish Region are not included in the official numbers for the French-speaking Community, since the French Community has no jurisdiction in that region. Their number is unknown, given the absence of sub-nationality status and the discouragement of linguistic criteria in census-taking. Estimates of the French-speaking population of Flanders vary from 120,000, around 200,000, to around 300,000. The French Community of Belgium makes up about 41% of the total population of Belgium; 58% of the population belongs to the Flemish Community, and 1% to the German-speaking Community. For years there have been hints that the Community wanted to better demonstrate the link between Wallonia and Brussels, the two main territories where the French speakers are in the majority. These include the creation of several organisations such as Wallonie-Bruxelles International, a public body in charge of international cultural affairs set up jointly by the French Community, the Walloon Region and the Commission communautaire française (COCOF, a French-speaking institution of the Brussels-Capital Region). The concept of "Wallonie-Bruxelles" is however not mentioned in the Belgian constitution, and appeared only in a few official legal texts, such as the "Arrêté du Gouvernement de la Communauté française fixant le code de qualité et de l'accueil" of 17 December 2003, mentioning the name "Communauté Wallonie-Bruxelles", and the "Arrêté du Gouvernement de la Communauté française approuvant le programme quinquennal de promotion de la santé 2004–2008" of 30 April 2004, mentioning the name "Communauté française Wallonie-Bruxelles". In May 2011, the parliament of the Community voted a resolution according to which it would, from then on, use the name "Wallonia-Brussels Federation" (French: "Fédération Wallonie-Bruxelles") for all its communications, campaigns and in the administration. The move was immediately interpreted as aggressive by the Flemish authorities, the Minister-President of Flanders announcing he would not recognize the federation as an official body and saying that documents that would be sent by the federation would be unconstitutional and therefore would not exist. While the authorities of the Community acknowledge the fact that the new name is not mentioned in the Belgian Constitution, they insist that their move is not illegal, as long as the new name is used as an additional name for the Community and is not used when it could create a legal issue (such as with the official texts published in the Belgian Official Journal). Although the then Belgian Prime Minister Yves Leterme said that the federal government would not use the new name  and the Flemish VRT decided not to use the new name in its news programs either, it is used by the French-speaking media, including the RTBF public network, which is fully controlled by the Community. The independent/private media uses both the alternative and the original designation. In September 2011, the Community adopted a new logo that incorporates its new name. The French Community of Belgium is governed by the Parliament of the French Community, which selects the executive branch, the Government of the French Community. The Parliament of the French Community (French: Parlement de la Communauté française or PCF) is the legislative assembly of the French Community of Belgium based in the Quartier Royal. It consists of all 75 members of the Walloon Parliament except German-speaking members (currently two) who are substituted by French-speaking members from the same party, and 19 members elected by the French linguistic group of the Parliament of the Brussels-Capital Region within the former body. These members are elected for a term of five years. The current President of the Parliament of the French Community is Philippe Courard [fr] (PS). The Cabinet of the French Community of Belgium (French: Gouvernement de la Communauté française) is the executive branch of the French Community, and it too sits in Brussels. It consists of a number of ministers chosen by the parliament and is headed by a Minister-President. Following the 25 May 2014 election, the PS (30 seats) and CDH (13 seats) parties formed a coalition. On 11 April 2016, Joëlle Milquet resigned as Minister of Compulsory Education, Culture and Child Care as she was accused of creating a conflict of interest in using her ministerial assistants to help her with a new election campaign in 2014. A few days later, Milquet was replaced by Marie-Martine Schyns and Alda Greoli. Schyns took over the Compulsory Education portfolio, which she was already in charge of during the previous legislature. Greoli took over Culture and Child Care from Milquet and also received the Sports portfolio from René Collin, who shifted to Agriculture and Tourism. In 2016, 63% of residents of Brussels and Wallonia declared themselves Catholics, 15% were practising Catholics and 30% were non-practising Catholics, 23% were Protestant, 4% were Muslim, 2% were of another religion and 26% were non-religious. ^ "Le Drapeau - Communauté française de Belgique". ^ a b lesoir.be (28 January 2016). "75% des francophones revendiquent une identité religieuse". lesoir.be. Retrieved 5 June 2017. Wikimedia Commons has media related to French community of Belgium. DéFI is a social-liberal, liberal, regionalist political party in Belgium mainly known for defending French-speakers’ interests in and near the Brussels region. The party is led since 1995 by Olivier Maingain, a member of the Chamber of Representatives. The party's current name, DéFI or Défi, is a backronym of Démocrate, Fédéraliste, Indépendant meaning "challenge" in French which was adopted in 2016. The Parliament of the Brussels-Capital Region, is the governing body of the Brussels-Capital Region, one of the three regions of Belgium. It is also known as the Brussels Regional Parliament. The Commission communautaire française (COCOF) or the French Community Commission is the local representative of the French-speaking authorities in the Brussels-Capital Region, one of the three regions of Belgium. This is a list of the Belgian federal, regional, and community governments. The Parliament of the French Community is the legislative assembly of the French Community of Belgium based in the Quartier Royal. It consists of all 75 members of the Walloon Parliament except German-speaking members who are substituted by French-speaking members from the same party, and 19 members elected by the French linguistic group of the Parliament of the Brussels-Capital Region within the former body. These members are elected for a term of five years. The Cabinet of the French Community of Belgium is the executive branch of the French Community of Belgium, and it sits in Brussels. It consists of a number of ministers chosen by the Parliament of the French Community and is headed by a Minister-President. The Francization of Brussels refers to the evolution, over the past two centuries, of this historically Dutch-speaking city into one where French has become the majority language and lingua franca. The main cause of this transition was the rapid assimilation of the Flemish population, amplified by immigration from France and Wallonia. Rattachism or Reunionism (Réunionisme) is a minor political ideology which calls for the French-speaking Belgium or Wallonia to secede from the state of Belgium and become part of France. 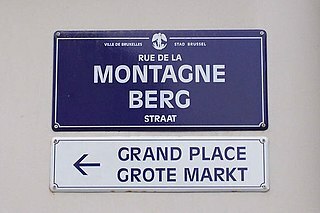 Brussels, which is majority French-speaking but enclave in Flanders, may be included within this ideology as may the six Flemish municipalities with language facilities for French-speakers. It can be considered a French-speaking equivalent of Orangism or Grootneerlandisme in Flanders. The Manifesto for Walloon Culture, was published in Liège on 15 September 1983 and signed by seventy-five "key figures in artistic, journalistic and university circles" of Wallonia.